Brian, Carmen and Jeff discuss mechanical gears in this episode of The Engineering Commons. Although a mechanical engineer, Jeff isn’t much for working on cars. We share a few stories about synchronizing generators, including use of a synchroscope. Brian mentions mechanisms with extremely high gear ratios. The two main functions of gears are trading off torque and speed, and reversing the direction of rotation. Spur gears are the most basic of mechanical gears. A spur gear profile is found in the Open Source Hardware Association logo. Carmen demonstrates his mastery of lyrics from the musical Grease. A commonsense explanation is provided by Jeff as to why gears need an integer number of teeth. If efficiency losses are ignored, ratios in the number of teeth between meshing spur gears provides the torque gain or rotational speed loss. Formula One racecar engines turn at very high rotational speeds. 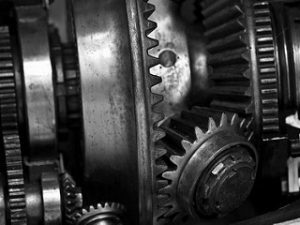 Gears are frequently used to increase the torque and decrease the speed of rotational actuators such as internal combustion engines or electric motors. A rack and pinion arrangement allows for converting between rotary and linear motion. Helical gears have curved teeth that allow for gradual tooth engagement, and they therefore run more quietly than spur gears. Bevel gears are often used to transfer power between shafts that are perpendicular to one another. Some basic gear set design considerations are detailed in the engineering information chapter of a Boston Gear product catalog. High gear ratios can be provided by a worm drive, but at the cost of lower mechanical efficiency. Planetary gear sets provide a great deal of flexibility, allowing for the merging of multiple torque inputs. Thanks to William Warby for use of the photograph titled “Gears.” Opening music by John Trimble, and concluding theme by Paul Stevenson. I am a student in Vancouver, WA studying mechanical engineering. I thought this episode was very interesting and the timing was perfect for me. I had the pleasure of visiting a machine and gear factory in Portland, OR for a tour yesterday (11/11). It was great to hear you guys talk about gears before I went on that tour. The name of the company I visited is “American Machine and Gear”. The tour was wonderful and so were all of the people working there. Thanks for continuously putting out great content, I hope you are all able to keep up the good work!